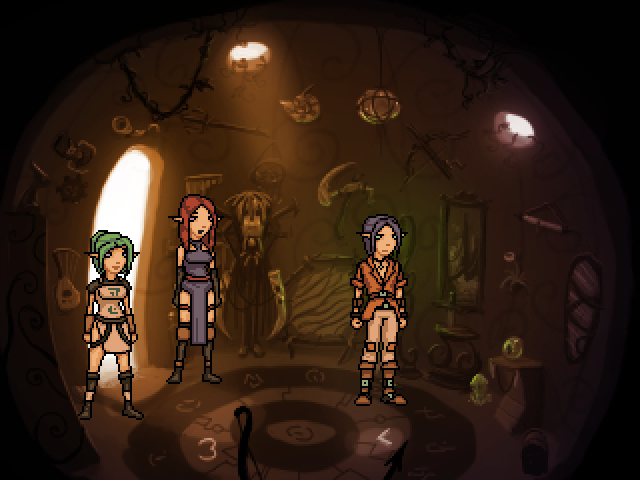 Othello, Vani and Edme have finally reached the long forgotten treasure room of the Emperor Kemal. Loaded with relics, it seems they have finally obtained the goal they've been chasing. This was made for the May 2011 MAGS competition. Go to the game's page! You're graphics are awesome as usual! Nice little game, played through, didn't spot any bugs. Was the title influenced by Carina? Cause if that's the case then <3. And EMPEROR KEMAL? I MEAN HOW MUCH DID BABAR REALLY PAY YOU FOR THIS!!?!!?!?! Probably it was! I remember trying to think of a title and then that popped up, so it seems likely. Damn, he's everywhere now! The last time I spotted him was in The Night of the Testicle. Seems like you can't play a Spanos-free game nowadays. Yeah... well... you're in the game as well (more sneakily though) so who are you to point fingers? Seems like the Thumb can't get a signal here. Although I have very little time these days, I surely must play this. If I don't have time, I'll make time. Fantastic game! Using the dagger on the chest says: I should examine the knife. Using the dagger on it says: I should examine this knife before.... Also a swap of mouseover labels? Loving the music as well, again. I can't believe I left debug mode on! Still playing. Othello's excuses to not tinker with any of those fascinating items are both extremely frustrating as well as full of some really interesting stories. Aye, once more I allowed my desire to let the player read a lot of detail outweigh their ability to solve puzzles without getting frustrated. Finished. Despite the talkiness really fun short game. I really like how the title works with the main themes of the game in less ways than three. The writing I felt was engaging and I enjoyed the relationships and reading all the legends, despite the fact I easily get tired of strange names in fantasy stories nowadays. Some quite creative uses of RPGey daggers in inventory puzzles too. Very nice Nemo music too. Igor: The strange name thing is very valid - I would have liked to made up more interesting ones, but ran out of time and so just sat there typing out whatever popped into my head at the time. I get sick of names that don't sound like names as well! Glad to see the dagger thing worked out, I thought it'd be neat to design puzzles based off the stats of weapons, and am a big fan of some CRPGs too. MediaFire isn't working here, could we have an alternate download location, please? and they were talking so much, that I maybe missed a clue on what to do next. nice game ben, I like the title and the elaborate explanations of all the items. Now that I watch Othello talk with Vani after opening the magic gate he is standig right in front of her, so that Vani is covered by him more than 50%. Looks strange. It's short but fun at the same time. Sure I am stuck but I am sure I will figure it out sooner or later.